Anderson took an unusual path to the NFL. He was late in entering college as he spent four years in the US Marine Corps following high school, where he played in the marching band rather than on the football team. Upon leaving the Marines, he entered Mt. San Jacinto Community College and began playing football, moving on to Utah from there. He was chosen by the Broncos in the sixth round of the 2000 NFL draft and, when injuries depleted the running back corps early in the season, moved into the lineup. Broncos went 11-5 to finish second in the AFC West and qualify for a Wild Card spot in the playoffs while leading the conference in total yards (6554), scoring (485 points), and touchdowns (58). Lost AFC Wild Card playoff to Baltimore Ravens (21-3). 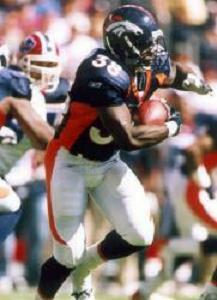 Anderson had a lesser season in 2001, rushing for 678 yards, and split time with injury-ridden star RB Terrell Davis. He was shifted to fullback in 2002, where he played well while running for 386 yards and blocking for rookie Clinton Portis. After another good year at fullback in ’03, Anderson lost all of 2004 with a knee injury. He returned to the running back position in ’05 and ran for 1014 yards. Signing as a free agent with the Baltimore Ravens, he backed up RB Jamal Lewis and saw scant action in 2006 and ’07, his last two seasons. Overall, Anderson rushed for 4067 yards on 919 carries (4.4 avg.) with 37 touchdowns and, never a proficient receiver out of the backfield, caught 92 passes for 727 yards and five more TDs.